A 22-slide PowerPoint presentation prepared jointly by the Arizona Department of Water Resources and the Central Arizona Project on behalf of the new Steering Committee is now available at ADWR’s Drought Contingency Plan web page. The presentation, released just before the July 26 Steering Committee meeting, offers an overview of the key elements for implementing a Lower Basin Drought Contingency Plan in Arizona. This first public meeting of the Steering Committee was scheduled at CAP headquarters in north Phoenix and is being videotaped for release on ADWR’s and CAP’s websites soon afterward. It is the first meeting of the group whose mission is to recommend an LB DCP that is acceptable to Arizona water users, and, ultimately, to facilitate Arizona joining with the rest of the Colorado River community in devising a strategy to protect Lake Mead from falling to intolerable elevations. The agenda is out for Thursday’s meeting of the newly formed Steering Committee that will recommend how to adopt and implement a Lower Basin Drought Contingency Plan for Arizona. The agenda can be found here and here. Thursday’s agenda includes plans for discussing four key elements for implementing a drought-contingency plan in Arizona. They will include: plans for mitigating the impact on agriculture of a Colorado River water delivery shortage; tribal “intentionally created surplus” (ICS) water for Lake Mead; an Arizona Conservation Plan; and issues involving excess Colorado River water. The Steering Committee was formed as a collaborative effort by the Arizona Department of Water Resources and the Central Arizona Project to help protect Lake Mead from falling to dangerously low levels. The Steering Committee’s mission is to recommend an LB DCP that is acceptable to Arizona water users. In addition to the July 26 event, eight more Steering Committee meetings are scheduled to be held between now and December. All meetings are open to the public. Thursday’s meeting, scheduled for 1-4 p.m. at CAP’s headquarters at 23636 N 7th Street in north Phoenix, will be recorded for a later posting on the ADWR and CAP websites. The next step toward bringing a Drought Contingency Plan in Arizona to closure is scheduled for Tuesday, July 10, at the Heard Museum in central Phoenix. Co-hosted once again by the Arizona Department of Water Resources and the Central Arizona Water Conservation District, the public meeting is set for 1-4 pm at the museum auditorium, located at 2301 N. Central Ave. The first step in this process – which is expected to open the door for legislative authorization for the ADWR Director to sign the system-wide DCP – began with a three-hour briefing on June 28. The briefing, as well as the renewed commitment to drought-contingency planning in Arizona, is spurred by the serious conditions facing the Colorado River system, especially the Lower Basin region and Lake Mead. The risks of Lake Mead falling below critically low reservoir elevations have tripled in the past decade, increasing the risks of potentially draconian reductions to Arizona’s Colorado River supply. The tools provided in existing guidelines created by agreements among the Colorado River states now are insufficient to address the current risks to the system. Information about that June 28 briefing, including a video recording of the entire proceeding, is available here. Also available at ADWR’s Drought Contingency Planning website is a background packet about the briefing, as well as the complete package of slide presentations by ADWR Director Buschatzke, Central Arizona Project General Manager Ted Cooke and Terry Fulp, the Lower Colorado Regional Director for the U.S. Bureau of Reclamation. A major focus of the July 10 briefing will include answering inquiries from the public about the DCP. ADWR and CAWCD staff fielded dozens of questions during the June 28 briefing, including questions from audience members and from online viewers. The event on July 10 – which will include technical staff from both organizations on hand – will devote more time for responding to questions from the public. The June 28 briefing closed with the announcement that an “Arizona Steering Committee” will be formed to discuss and recommend how to adopt and implement the Drought Contingency Plan in the Lower Basin of the Colorado River system in a way that is acceptable to Arizona water users. While the delegates to the Steering Committee will be by invitation jointly provided by ADWR and CAWCD, the meetings and discussions will be open, and the public is invited to participate. The Steering Committee is tentatively scheduled to conduct its first public meeting on July 26th. Additional details can be found at https://new.azwater.gov/lbdcp and www.cap-az.com/AZDCP . When: July 10, 1-4 p.m. In a joint statement in May, our agencies, the Arizona Department of Water Resources (ADWR) and Central Arizona Water Conservation District (CAWCD) announced that we are committed to bringing the Lower Basin Drought Contingency Plan (LBDCP) to closure in Arizona by addressing a broad range of issues that respect the concerns of all stakeholders across the state. The discussions between ADWR and CAWCD were only the first step and today, we hosted a public briefing describing the proposed LBDCP, which was developed to address those risks. Colorado River managers were invited to learn about the LBDCP and its importance within Arizona. We were joined by the U.S. Bureau of Reclamation Commissioner Brenda Burman. The Bureau of Reclamation discussed how the risks to the Colorado River have increased from what was expected when the Interim Guidelines for Lower Basin Shortages were established in 2007. In fact, the risks of Lake Mead falling below critically low reservoir elevations have tripled in the past decade, increasing the risks of potentially draconian reductions to Arizona’s Colorado River supply. The tools provided in those guidelines now are insufficient to address the current risks to the system. In recognition of these increasing risks, Arizona, California, Nevada, and Mexico have worked together in recent years to voluntarily contribute water to Lake Mead. These efforts include system conservation programs and storage programs, and have served to stave off shortages in the Lower Basin from 2015 through 2018, and very likely in 2019. We recognize that even these efforts may not be sufficient to reduce the risks posed by a drier future on the Colorado River. In today’s briefing, we outlined a framework of additional measures to reduce risks in the Colorado River system, called the Lower Basin Drought Contingency Plan (LBDCP). Additional contributions to Lake Mead from Arizona and Nevada, along with new contributions from California and the United States. Incentives for additional storage in Lake Mead by creating flexibility for water users to store water and take delivery of storage even during lower reservoir conditions. A commitment by parties in the Lower Basin to protect elevation 1020 feet in Lake Mead, implemented through consultation to determine what additional measures would be necessary to protect that elevation. Implementation of the Lower Basin Drought Contingency Plan will trigger additional contributions from Mexico through the Binational Water Scarcity Contingency Plan as detailed in the Minute 323 agreement, adopted in 2017. Projections by the U.S. Bureau of Reclamation show that the LBDCP, along with contributions from Mexico and actions by the Upper Basin States, would reduce the risks of falling below critical elevations in Lake Mead. The LBDCP achieves this reduction of risks by requiring additional incremental water-delivery reductions by Arizona water users. These reductions will impact Arizona’s junior Colorado River priority holders. The LBDCP has the potential to impact to all CAP priority pools, but the most significant impacts are likely to be to the CAP NIA priority pool. This briefing was the beginning of a series of public discussions involving many Colorado River water users, elected officials, and other key stakeholders in Arizona. We recognize that the LBDCP and its impacts are complex issues, and there will be more questions than those addressed today. Therefore, we have scheduled a meeting on July 10 at the Heard Museum to answer questions, as well as to provide additional details about the LBDCP. Today’s briefing closed with the announcement that an Arizona Steering Committee will be formed to discuss and recommend how to adopt and implement the LBDCP in a way that is acceptable to Arizona water users. While the delegates to the Steering Committee will be by invitation jointly provided by ADWR and CAWCD, the meetings and discussions will be open, and the public is invited to participate. The Steering Committee is tentatively scheduled to conduct its first public meeting on July 26th. Additional details will be provided at our websites www.azwater.gov and www.cap-az.com/AZDCP. We recognize that more must be done to protect Arizona’s Colorado River users from the uncertainty and risks of critically low elevations in Lake Mead. We are committed to working with Arizona water users and other stakeholders to adopt and implement the LBDCP in a way that is acceptable to Arizona water users. New Mexico journalist John Fleck, whose well-informed blog has long served as a sort of news pathfinder regarding Colorado River issues, just posted a lengthy take on the briefing to be co-sponsored by the Arizona Department of Water Resources and the Central Arizona Project in Tempe on June 28. The briefing, which is to feature Bureau of Reclamation Commissioner Brenda Burman as keynote speaker, will examine the systemic risks posed by potential shortages on the Colorado River. The event also represents the kick-off of a continuing Arizona discussion on how to adopt and implement the plans of the Lower Basin states of Arizona, California and Nevada for contending with a delivery shortfall, known as the Drought Contingency Plan (see details of the briefing below). The June 28 event will be livestreamed. According to Fleck, a shortfall in deliveries of Colorado River water will constitute a lesson in the difference between an “allocation” of water from the river and an “entitlement” to that water. Fleck illustrates the various challenges facing Colorado River water-users with an examination of agriculture in Pinal County, where the river water delivered via the CAP canal system is subject to availability. It’s an interesting analysis and well worth a read. When: June 28, 1-4 pm. By clear consensus, the most important issue currently facing the Colorado River system is the as-yet unresolved question of what the states will do to lessen the risks of draconian shortages on the Colorado River. What, exactly, will the Lower Basin states – Arizona, California and Nevada — do to assure that instability at Lake Mead doesn’t lead toward the perilous state known as “dead pool,” in which water no longer can be drawn from the reservoir? For several years, all seven Colorado River states, as well as the federal Bureau of Reclamation, have wrestled with the questions surrounding shortage on the Colorado River – how to implement a comprehensive Drought Contingency Plan that will manage the risks of an unstable Lake Mead presented by the on-going regional drought and over-allocation of river water. Eleven years later, it is clear those triggers – formally, the 2007 Colorado River Interim Guidelines for Lower Basin Shortages and Coordinated Operations for Lake Powell and Lake Mead — are not enough. Arizona is the only state in the system that requires legislative approval to sign a plan with our out-of-state river partners to deal with the difficult questions surrounding a shortage. The State’s water community is contending with those issues now. On Thursday, June 28, the Arizona Department of Water Resources and the Central Arizona Project will co-sponsor a panel discussion of the systemic risks posed by potential shortage, as well as announce the kick off of an Arizona discussion on how to adopt and implement the Lower Basin Drought Contingency Plan. Keynote speaker at the event will be Brenda Burman, Commissioner of the federal Bureau of Reclamation, who plans to discuss the risks to the system. The event will include presentations from ADWR Director Tom Buschatzke and CAP General Manager Ted Cooke, as well as demonstrations depicting current river conditions from Bureau of Reclamation staff. There will be a limited question-and-answer session following the presentations. Follow up discussions are scheduled for later in the month. Special Note: The event will be livestreamed. After nearly ten months of evaluation, the Arizona Department of Water Resources has recommended that the Secretary of the Interior deny a proposed lease of the town of Quartzsite’s Colorado River allocation to the Central Arizona Water Conservation District. On August 2, 2017, Quartzsite and the CAWCD submitted a request for consultation to the Department for the proposed lease to the District of its 1,070 acre-feet per year allocation. CAWCD is seeking the water to partially fulfill its statutory groundwater-replenishment obligations. “For that reason, the Department recommends that the United States deny the proposed lease if it is submitted for approval by Quartzsite and CAWCD,” wrote Buschatzke. Well-respected water journalist and author John Fleck is serving up some intriguing thoughts on his blog about a recent press release issued by the Bureau of Reclamation. Author of Water is for Fighting Over: and Other Myths about Water in the West, Fleck contends the Bureau’s press release was less of a traditional press announcement than an implicit call to action directed at the Colorado River basin states. Fleck argues that Bureau of Reclamation Commissioner Brenda Burman used the press statement as an opportunity to kick-start the effort to finalize drought-contingency planning among the seven Colorado River states.It’s hard to argue with Fleck’s point. As quoted in her press release, Commissioner Burman observes that “(w)e need action and we need it now. “We can’t afford to wait for a crisis before we implement drought contingency plans,” she said. “The completion of the lower basin states’ Drought Contingency Plan is vitally important to Arizonans,” wrote Tom Buschatzke, Director of the Arizona Department of Water Resources. At a highly anticipated public meeting on water issues in Yuma on Friday, Arizona Department of Water Resources Director Tom Buschatzke told legislators and a packed audience that sound management of Arizona’s Colorado River supplies requires forbidding the operator of the Central Arizona Project canal from using “sovereign immunity” as a legal weapon against folks with Colorado River water entitlements. “The State has concerns that [the Central Arizona Water Conservation District, operator of the CAP canal] will attempt to use the defense of sovereign immunity at the expense of water users in Arizona,” said Buschatzke. CAWCD has maneuvered, unsuccessfully thus far, to just do that. “Sovereign immunity” is a legal protection that indemnifies some public entities – such as states and the federal government – from many types of lawsuits. CAWCD has acknowledged that gaining sovereign immunity as a so-called “arm of the State” of Arizona is of “fundamental importance” to the canal operator. The Director reminded lawmakers that the District has attempted to use the defense in the past, notably in a federal case involving a Colorado River water entitlement holder, the Ak Chin Indian Community. “To prevent CAWCD from claiming sovereign immunity in the future, the Governor’s Office and DWR proposed legislation that would clarify that CAWCD is not entitled to sovereign immunity in any type of lawsuit,” said Buschatzke. Buschatzke delivered his remarks at a special “Learning Tour” organized by legislative leaders seeking public input on proposals to reform Arizona water laws. Organized by Sen. Gail Griffin and Rep. Rusty Bowers — chairmen, respectively, of the Senate and House natural resources committees — the tour already has taken public commentary at a meeting on March 9 in Casa Grande. In addition to his oral testimony expressing opposition to CAWCD’s pursuit of a “sovereign immunity” legal defense against its own customers, Buschatzke also provided the panel with a more expansive written testimony. That written statement illustrated the State’s priorities in reforming Arizona water law this year. Those priorities include taking action to protect Lake Mead from falling to critically low elevation. Among those actions: winning legislative authority to finalize a “Drought Contingency Plan” with Arizona’s Lower Basin Colorado River partners. A central feature of that plan is giving the ADWR Director authority to “forbear” delivery of Colorado River water conserved by an Arizona Contractor in Lake Mead. That means the Director would assure no other contractor could take that water from the troubled reservoir. My name is Tom Buschatzke. I am the Director of the Arizona Department of Water Resources or DWR. I know that most of you are familiar with DWR, but for those who are not, it is the agency designated by the Legislature to represent the State of Arizona with the United States, other states, and Mexico on matters involving the Colorado River. The State Legislature and DWR, working with the Governor, are the appropriate entities to represent the State. DWR is also the agency tasked with protecting the State’s rights to Colorado River water. I take those responsibilities very seriously. Colorado River water is vital to our State. No one knows that better than the people who live and work in Yuma, where approximately 1 million of Arizona’s 2.8 million acre-feet of Colorado River water is used. Colorado River supplies are becoming increasingly at-risk. Continuous, long-term drought coupled with an over-allocation of Colorado River supplies, the structural deficit, has not only brought Lake Mead to the brink of shortage, it has increased the probability of the Lake dropping to critically low elevations that could affect all Colorado River water users in the State. The volume of water that Arizona receives every year from the Colorado River is tied to Lake Mead elevations. Once the Lake’s elevation falls below 1,075 feet, Arizona deliveries are reduced by 320,000 acre-feet, approximately 11% of Arizona’s total Colorado River allocation. Deeper, more extensive shortages occur at lower “trigger” elevations. Early shortages will hit water users in Central Arizona, and particularly the CAGRD and the Arizona Water Banking Authority, the hardest. At even lower elevations, draconian reductions will be necessary to protect remaining water supplies in the Lake. Yuma water contractors hold some of the most senior rights on the River. But even senior rights are at risk when Lake Mead elevations plunge. If Lake Mead reaches deadpool at elevation 895 feet, no water can move past the dam. Picture a bathtub with only an overflow drain. It could have water in the tub that you could not get out of the tub. That is what “deadpool” is. We anticipate that the Secretary of the Interior will act to avoid the Lake reaching deadpool, but we can’t know how. Modelling projects that waiting to act until the Lake reaches elevation 1020 could result in a 3 to 6 million acre-feet reduction in the Lower Basin. All Arizona Contractors should be concerned about the uncertainty that could result from possible Secretarial intervention. To address this increasing risk, beginning in 2015 DWR, on behalf of Arizona, began meeting with representatives of California and Nevada, which also receive Colorado River water from Lake Mead, and the federal government to devise ways to keep more water in Lake Mead. That group developed a water management framework designed to do just that, called the Drought Contingency Plan or DCP. The DCP is not yet in effect. There are still aspects of it which need to be resolved, and ultimately, the Legislature must approve it. But the core commitments embodied in the DCP are historically remarkable in many ways. The plan contains a collective commitment on behalf of the Lower Basin states to protect against Lake elevations falling below elevation 1020. It would require California, for the first time, to participate in mandatory shortage reductions. 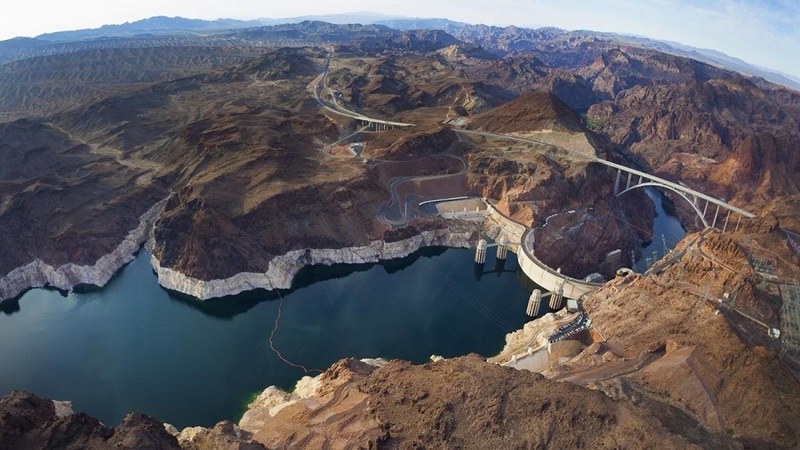 It also contains additional efforts by Nevada to conserve water in Lake Mead, and through its connection to Minute 323 to the Mexico Water Treaty, would require additional water savings from Mexico. In order to receive these benefits, Arizona must be willing to give something as well. The DCP contemplates that Arizona will begin taking shortages at higher Lake elevations, Specifically, Arizona would be required to leave 192,000 acre-feet in Lake Mead at elevation 1090. Impacts of that additional reduction will be partially mitigated when Lake Mead is kept above elevation 1075 by keeping CAP agriculture’s water supply whole. Incentives included in the DCP for conservation by Nevada, California, and Mexico are expected to help achieve that goal. But Arizona must also act to conserve water in Lake Mead to achieve that goal. Those actions by Arizona are known as DCP Plus. In June of 2017, the Governor’s Office convened a group of stakeholders to deliver support for DCP and to find a way to make DCP Plus work. During that process, the Governor’s Office and DWR proposed a program to facilitate conservation efforts by Arizona Colorado River Contractors to target maintaining Lake elevations at or around 1,080 feet. The proposed program would facilitate conservation in several ways, one of which is to ensure that water that is kept or stored in Lake Mead by an Arizona Contractor would not be taken out by another Arizona water user. This last feature is achieved by giving the ADWR Director authority to “forbear” delivery of the water to other water users. The Governor’s proposal has met with resistance. One the most vocal opponents has been CAWCD. CAWCD is resisting efforts for all Colorado River water contractors to create conserved water, and in the process has sought to exercise an outsized role in shaping Arizona’s Colorado River water policy. For example, Arizona Indian tribes have rights to nearly half of all the Colorado River water delivered through the CAP canal. At least one of those tribes, the Gila River Indian Community, is already leaving water in the Lake to help prop up Lake elevations. Tribes are interested in conserving additional water in Lake Mead through the creation of something known as Intentionally Created Surplus. Both the U.S. and the State of Arizona agree that they have the legal right to create ICS. However, to date, CAWCD refuses to recognize that right. We need all hands on deck within the State of Arizona. With respect to DWR and the Governor’s Conservation Program proposal, CAWCD has asserted that it should have veto authority in all decisions about who in Arizona can conserve water and under what conditions. CAWCD is governed by elected officials from Maricopa, Pima, and Pinal counties, yet they make decisions affecting all of Arizona. Several actions taken by CAWCD over the past few years demonstrate that CAWCD gives little thought to the broader statewide impacts of its actions. In 2014, the CAWCD entered into an agreement with the Metropolitan Water District of Southern California, the Southern Nevada Water Authority, and Denver Water for a pilot program to fund the creation of Colorado River system water through voluntary water conservation. Water that was left in Lake Mead pursuant to that agreement has been important in avoiding shortage, and no one seeks to deny or minimize that fact. However, that agreement was negotiated without the involvement of DWR, and contains at least one provision that should cause concern throughout the State of Arizona. The pilot agreement recognizes conservation through reductions in the “consumptive use” of Colorado River water; however, rather than defining consumptive uses with reference to the “Colorado River mainstream,” as it was defined in U.S. Supreme Court’s Decree in the landmark case of Arizona v. California, the pilot agreement allows for the creation of system water through reductions to consumptive uses of water from the “Colorado River System,” including “water drawn from the Colorado River System by underground pumping.” The term “Colorado River System,” is defined in the pilot agreement to have the same meaning as in the 1922 Interstate Compact among the seven Basin States, which included not only the Colorado River mainstream in its definition, but also all of its tributaries. We vigorously disagree with this reckless definition of “consumptive use.” It flies in the face of the landmark Supreme Court decision, Arizona v. California and the Boulder Canyon Project Act of 1928. The literal reading of this language suggests that all wells used by agriculture, industry, mining, cities, towns, and counties connected to water that is tributary to the Colorado River might be pumping Colorado River System water. If that were the case, all of those wells would need a contract with the Secretary of the Interior and those withdrawals would count against Arizona allocation of 2.8 million acre-feet. It appears that CAWCD gave no thought to the potential impacts of this language on water users across the State. CAWCD’s disregard of the impacts of actions to other water users is also evidenced in its relentless efforts to claim sovereign immunity under the Eleventh Amendment of the U.S. Constitution. Under the Eleventh Amendment, states cannot be sued in federal court with certain exceptions. Political subdivisions of the state, like CAWCD, generally are not entitled to claim this immunity. CAWCD nevertheless raised the defense in 2012 in an employment case filed in federal district court known as the Gressett case. CAWCD argued that it should be entitled to sovereign immunity because it is an “arm of the State.” The district court rejected that argument. CAWCD appealed the ruling and, in an effort to convince the Ninth Circuit Court of Appeals that it is an arm of the State, it made inaccurate claims about its authority and responsibility in securing and managing Colorado River water. CAWCD also argued that the State of Arizona would be functionally liable for CAWCD’s debts if CAWCD were unable to meet them. In fact, CAWCD was established to ensure that the cost of repayment of the State’s share of the construction of the Central Arizona Project would be borne by water users and tax payers in the three counties that benefit from CAP water deliveries, and not by the taxpayers in Arizona’s 12 remaining counties, who rely on other water supplies. The State has concerns that CAWCD will attempt to use the defense of sovereign immunity at the expense of water users in Arizona. And in fact, CAWCD raised the defense in a case brought by the Ak-Chin Indian Community regarding the Community’s rights to the delivery of Colorado River water. The State of Arizona opposed CAWCD’s attempts to obtain a court ruling that it has sovereign immunity. CAWCD settled that case before the Ninth Circuit ruled on it. CAWCD testified to the Legislature in early February that sovereign immunity is limited, and that it would not be used in contractual disputes. However, on February 26, 2018, CAWCD requested the court vacate its decision so that it can raise the defense of sovereign immunity in future lawsuits. CAWCD said that sovereign immunity is of “fundamental importance” to it. The State opposed this action as well. The State is seeking a permanent resolution to this issue. To prevent CAWCD from claiming sovereign immunity in the future, the Governor’s Office and DWR have proposed legislation that would clarify that CAWCD is not entitled to sovereign immunity in any type of lawsuit. But that legislation appears nowhere in any bill. We are committed to protecting Colorado River water users in Yuma, La Paz, and Mohave counties, as well as those water users within CAWCD’s service area. I would like to see our proposed legislation move forward this session. 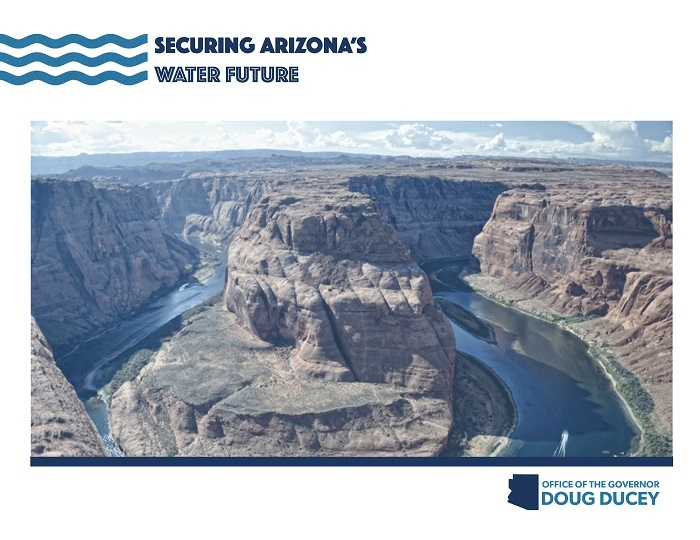 The Governor’s Office has released “Securing Arizona’s Water Future,” an illustrated outline of Governor Ducey’s plan for taking action to help secure the State’s water supplies. The “water book,” as it is known, is available on the Governor’s website. It escorts readers through Arizona’s storied (and, often, trailblazing) history of water management, including a candid outline of the challenges now facing the State in this era of drought. It also proposes legislative solutions to those issues. Arizona is a renowned leader in water management thanks to its long history of careful planning and effective governance. But, with the State facing serious challenges to some of its key water supplies, the Governor’s Office asserts that the time to act on water policy is now. “Earning Arizona’s reputation as a national leader in water management was no easy feat and it didn’t happen by accident. It was the proactive nature of our predecessors, and our state’s willingness to take-on complex issues. As the water book illustrates, Arizona relies on the Colorado River for 40 percent of its water supply. Unfortunately, the Colorado River system has experienced severe drought conditions for more than 17 years. Lake Mead, a vital reservoir on the Colorado River, is less than 40 percent full. Lake Mead water levels are important because they determine whether a shortage is declared in the State’s Colorado River allocation, which would result in decreased delivery levels of water. Based on data from the Bureau of Reclamation, the threat of a shortage declaration by the Bureau at Lake Mead is real. Building on Arizona’s history of responsible initiatives, the Governor’s Office has proposed a plan that focuses on strategic conservation. The plan also calls for protecting consumers through responsible groundwater management and by speaking with one voice on water-management issues, particularly regarding the Colorado River. Governor Ducey’s plan would better enable voluntary conservation of Colorado River water by providing the State with forbearance authority relating to specified circumstances. This would contribute to higher Lake Mead elevations, reducing the likelihood of a shortage and providing increased protection from the economic consequences of water-delivery reductions. With an eye toward achieving the management goals of Active Management Areas (the geographic areas created through Arizona’s landmark 1980 Groundwater Management Act), the Governor’s proposal would also establish an advisory committee to monitor the progress of AMAs. Finally, since decisions about Arizona’s water supply affect the entire state, the Governor’s plan ensures accountability by requiring State authorization before entering into interstate deals involving Colorado River water.